So here we are at the end of day three of our trip home with our new boat. It is Monday evening, about 9pm and the water is calm, lights from the surrounding communities reflect in long streaks across the water. A light breeze is blowing through the cockpit, a welcome respite after a hot day. We are on a town mooring tonight in Part Washington on Long Island. The town has several moorings balls which they provide free for up to two nights to transient boaters. But let me pick up the story from where Jay left off. On Sunday morning, we weighed anchor about 7am and exited Barnegat Inlet out into the Atlantic Ocean. Barnegat Light, the second oldest lighthouse in continuous use in the United States, stands as a silent sentinel marking the narrow entrance. The wind was fairly light, so we motored past the Light. The long jetty opposite the Light held twenty or thirty campers, truck campers and fishermen. We were not the only boat heading out into the Atlantic. Several recreational fishing boats passed us on their way to spend a Sunday fishing. Before long, we were out in the Atlantic and turning north. Because the wind and waves were so calm, we decided to follow the shore buoys about a mile and a half out. The day was hazy with early morning fog. Before long, the bottom of Barenegat Light was obscured. The day remained calm and what wind did exist was on our nose, so we ended up motoring. It was our first chance to use the autopilot and wow was it wonderful! Definitely like having an extra pair of hands aboard. We chatted, listened to music, read and kept a constant lookout as there were there was many times more sea traffic then in the Northumberland Strait. Mid afternoon, we rounded Sandy Hook and caught our first glimpse of Manhattan in the far distance. We turned in towards Atlantic Highlands on the New Jersey shore and headed directly for the marina for a diesel and water top up. We hung around the fuel dock for 15 minutes waiting for a space, It gave Jay a chance to practice reversing the boat. We pulled into the fuel dock without incident with the help of a friendly dockhand and took on fuel and diesel. We left the dock and went east along the coast to just outside the mooring area and anchored amongst several other boats, two of whom were Canadian flagged. After anchoring, we unhooked the dinghy, attached the motor and headed for the dinghy dock to explore. We spent several hours ashore, stretching our legs and picking up a handful of groceries. We returned to the boat just before dusk and made supper. We stretched out in the cockpit and relaxed. We could hear fireworks, but the hills ahead of us were hiding them from view. The night before in Barnegat Inlet we had watched fireworks from the cockpit and earlier tonight as I started tying this someone one was setting off some fireworks in their back yard. It is Memorial Day weekend here and Americans know how to celebrate the holidays. But just as majestic as fireworks was the Verazzano Bridge all lit up in the distance and the skyline of Manhattan. Our biggest disappointment was the lack of internet signal. This morning I woke up at 6am and climbed out into the cockpit to make sure all was well. The sky was filled with dark clouds and the wind was picking up. I went below and mentioned to Jay that I thought rain was coming and started to close the forward hatches. Before I even had the fist ones closed the rain started. A full blown rain and wind storm was upon us momentarily. We heard thunder in the distance and saw two flashes of lightening, but it passed farther to the east of us. After about an hour the rain stopped and the wind died off. We were taking our time getting underway anyway as we wanted to time our arrival at the infamous Hells Gate where the East River takes a hard turn and the current can reach 5 knots or more. We left our anchorage about 10am. The sky was still a bit cloudy but the warm sun foretold another blistering hot day. We were glad to be on the water. As we rounded the breakwater out of the anchorage we set the sails and spent the next hour speeding across the water at 6.5 knots. However, it was not to last. Just over an hour later we were almost becalmed. We motorsailed for a short period and then decided to furl them in and go under power. However, our forward progress was hampered by a 2 knot current exiting the Narrows. We didn't push the engine as the we knew we would be too early for Hells Gate if we did. As we came under the Narrows Bridge we got our first glimpse of the Statue of Liberty. It was hot and sunny by now and her flame gleamed brightly in the sun. 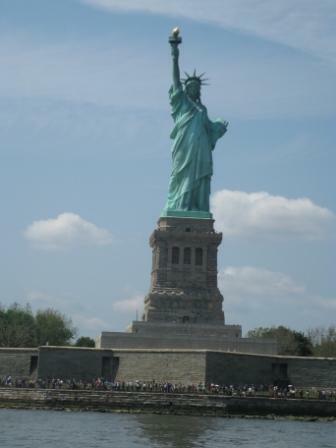 Neither Jay nor I have visited New York City and here we were seeing the green lady herself from the water on our new sailboat. The Harbour was bus y with commercial traffic, freighters, tugs, barges and ferries, Coast Guard, power boats and sailboats of all sizes and shapes. We passed in front of the Statue of Liberty and then in front of Manhattan before entering the East River. The majesty of the buildings had me a bit awestruck. I was also acutely aware of the noise. Choppers and planes were constantly over head and boats were roaring by with no concern for the wake they caused a sailboat. You could often hear traffic noise as well. As we proceeded down the East River, the current finally had turned in our direction. Although our boat speed was 5.6 knots the speed quickly climbed to 7 knots, then a sustained 9.8 knots. Once we even saw a high of 10.6 knots! No wonder a sailboat needs to time a passage with the currents! After passing through Hells Gate, we passed Rikers Island and La Guardia airport. Before long we had passed Throgs Neck and were out into Long Island Sound. We entered the beautiful Manhasset Bay, with gorgeous homes lining the and picked up a town mooring about 6pm. Again we untied the dinghy and took a spin into town. Although we had a nice walk, we only found one open wifi spot and we accessed email with our Blackberrys. Perhaps tomorrow we will get an internet connection somewhere and we will post this. In the meantime, I am going to sign off and enjoy the beautiful evening in the cockpit. Movies love using the plot device that starts with our hero in some kind of predicament or unexplicable situation. The action on the screen freezes at a climactic moment, and the words "one month ago" flashes across the screen. The real story then starts, having given the viewers a taste of the future. Well, this is my opening sequence. It's a hot day, with temperatures in the 30's (for all you non-Celsius readers, that's hot). The sun is out, but the day is hazy and quite humid. The heat is countered by a fresh breeze blowing across the waters of Barnegat Bay, NJ. No buildings block the wind, because I'm sitting out in the cockpit of a new-to-us 37 foot Beneteau 373 sailboat, anchored in a shallow inlet along with a handful of other boats, looking at the lighthouse at Barnegat Light, marking th entrance to the Atlantic Ocean. We had spent a lot of time deciding to upgrade from Obsession to a larger sailboat. We had only owned Obsession for three years, and had thoroughly enjoyed cruising on her. But, Obsession was our first cruising sailboat, and we knew we wanted to move up. A Beneteau 305 is a cuiser-racer, and is actually designed more along the lines of racing with the occasional weekend cruise. When we bought Obsession, we mused that we would like to race once and a while, but with the exception of the Montague Regatta one summer, we never did. However, we discovered that we liked the cruising aspect more and more. For the longer term cruising we want to do, we wanted a bit more living space. So the search began, helped along by a strong Canadian dollar (making US-based boats cheaper) and a depressed boating market because of the economic problems. 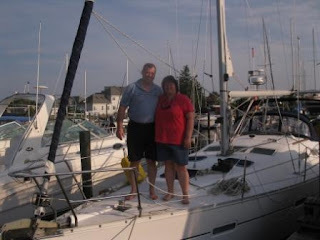 April saw us driving down into the US to take a look at a couple of Beneteau 373s that caught our eye. One was in New York state on the Hudson River above New york City. The second was in Bayville, New Jersey. The latter was a dream boat. For cruising, there was a lot of equipment and upgrades we would want for our new boat, and we thought we would buy a boat and then add equipment over the next couple of years. The New Jersey boat came with almost everything we would want. Unfortunately, it had a price tag well outside our budget. However, a little compromise on our part and on the part of the previous owners made the deal work. Suddenly, we had an agreement to buy our new sailboat. It was in New Jerey, and would become ours on May 25th. So began the most hectic four weeks of our lives. Both of us had multiple work commitments to complete, which meant many late nights and crazy hours. Also, May is when we open our book store for the season, so even without having to prepare for the new boat, it is already a very busy season. Now, we had also added getting Obsession on the market, preparing for the trip down to the US, finalizing the details of the sale, making financial arrangements, planning for the trip back home, and determining what other additions we might want to add to the boat. Finally, we managed to survive to our day of departure, which involved final packing at 2am. Michelle's parents were driving us down, since it's never very difficult to convince them to go on a driving trip. We had been told by our broker to make a list of all items that we were bringing to the US for the trip back to Canada, and to stop at Canada Customs to get it stamped. We pulled into the Customs office at the border in St Stephen, NB, and the officers there cleared our list very quickly. At the US border, they asked a few more questions than usual, but we weren't there for long before passing through. We made it to Portland, Maine the first night. The second night we went through the edge of New York City and stopped at Toms River, NJ, just a few minute drive from our boat. Although we had mostly finished our work commitments, there were still some remining tasks to complete. One advantage of the work we do is that we are very mobile. Each evening in the hotel, I would spend a few hours working. That night in Tom's River, I had to complete a project by the next day, so I spent six hours after we stopped. In fact, during that drive on the second day, I had to make a work phone call, so we pulled over to a rest area in Connecticut for an hour while I called Ottawa to discuss my project. Finally, the immediate work deadlines were completely out of the way, and we had a few days to concentrate on the boat. On Wednesday morning, we drove the few minutes out to the marina, where we finally got to take posession of Aquaries. The previous owners were there to meet us, and turned out to be a wonderful couple. They had just moved from NJ to Florida, and had decided it was time to sell their boat. It was wonderful to spend a few days with them, giving us time to get to know them and our new boat. They were incredibly helpful and spent lots of time with us going over the boat's systems and the modifications they had made and showing us how everything worked. It was so wonderful to have had that time. Our only regret was that we did not get a chance to spend even more time with them. We hope we will keep in touch with them. We promise to care for the boat as carefully as they did! We love the boat. It is like it was made for us. As for a name, we are importing the boat into Canada and registering it then, so a new name will wait have to wait for a few weeks. The first day of ownership was a whirlwind. Since we were sailing her home, we had to be provisioned for an extended cruise. First up was grocery shopping. Because we were coming across the border, we took very little food with us. That meant we had to buy all the basic provisions, along with lots of non-perishable items to last the length of our trip. Over the next couple of day, we made multiple trips to the grocery store as we would discover items that we had not purchased earlier, or to stock up on additional provisions. Having a vehicle for on-land transportation was a luxury we would not have for long, so we took advantage and purchased extra items like water, which is very heavy and awkward to carry on foot. As for the boat, the main item which we needed was a dinghy. Our plan is to anchor as much as possible on our return trip. Marinas are usually much more convenient, but they are also much more expensive. Having a dinghy is then the only way to get supplies back to the boat, or to visit the areas near our anchorage. 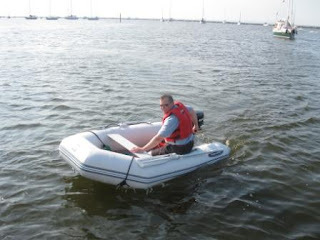 We purchased an inflatable 9 foot dinghy from West Marine, along with a 6hp engine. Getting the boat ready was so busy that, although we got the dinghy inflated and tied to the stern of Aquaries, we still haven't used it. 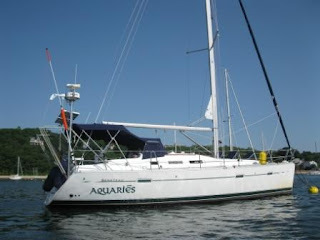 The boat has refrigeration and a freezer, air conditioning and reverse cycle heat, TV, DVD, microwave, wind power generator, solar panels, davits, bow and stern washdowns, bimini, dodger, auopilot and chartplotter and, best of all, the V-berth has been converted to an office. With lots of extra storage space the boat is very comfortable for much longer cruises than the 2-3 week cruises we did on Obsession. The previous 4 weeks and the three days in Bayville getting the boat ready were crazy busy, but now we are on our way. We left Tom's River this morning and headed south to Barnegat Inlet where we anchored. Tomorrow we leave for Sandy Hook and our first short ocean passage of the trip. By Monday we should be passing through Hells Gate and into Long Island Sound if all goes as planned. We'll try and keep posting blogs of our trip, although internet connections are hard to come by at times.